Current users Attention: DO NOT download and re-install from the Link Below, use the "New Version Available" link above, and extract the Zip file to the current location of your ErgMonitor.exe file. (This will be a much shorter download for you. Running the installer a second time will disable your Activation key and you will have to go through the embarrassing process of requesting another because you did not follow directions) - Cheers! 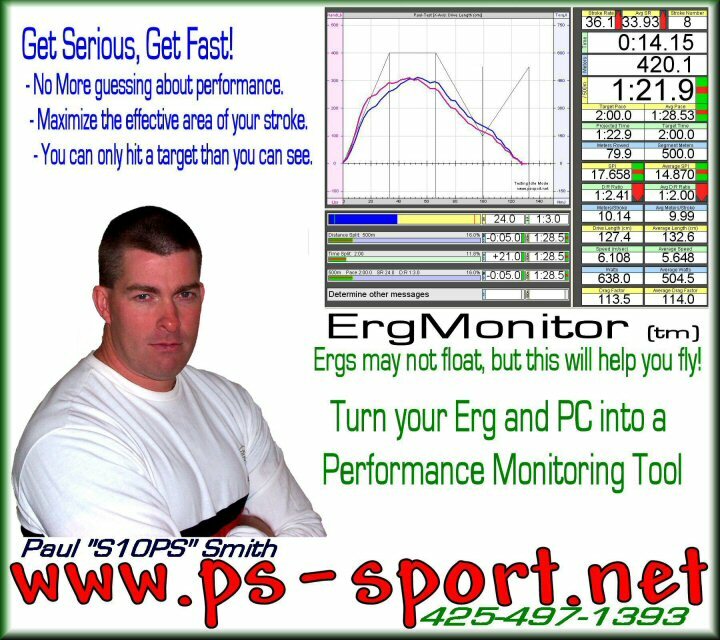 Welcome to the introduction of ErgMonitor(tm), the moment every serious Rower/Erger has been waiting for has arrived. The ability to view your Force/Time curve in real-time is now just a download away. The first thing that you will want to do is Read the User Guide, it will give you an idea of what is required to run ErgMonitor and the process of setting your computer up. There are some hardware pieces that need to be obtained also, and these are listed in the User Guide. If you decide that you would like to try ErgMonitor, the Installer can be downloaded here (Zip File, Extract to a temporary location on your hard drive and run Setup.exe). To get a Demo (Free) Key, you will need to email Paul or Mike , please include your full name in the body of the message, or use the "Buy Now" button to order a Single User License Key. Your key will be sent through reply email. Click button to order. Cookies & Scripts Enabled? Do I need a PM2+ to use ErgMonitor? No, The PM1, PM2(+) is essentially replaced, any standard Concept 2 Model B or C will work. Will ErgMonitor work with my Model D? Yes, the parts list changes a bit due to the new Sensor cable. Radio Shack part #42-2495 and #274-397 will be required, the sensor plugs into 274-397 and then 42-2495 splits the signal as needed (The red plug is the one that goes to the sound card.) So far this works fine on Desktop computers, but is inconsistent on laptops, which we believe is due to system noise. 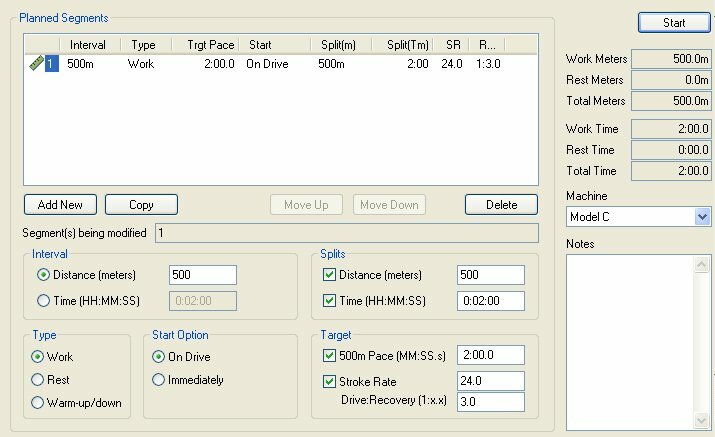 Will I still be able to use my regular performance monitor? Yes, it is merely a matter of plugging the sensor back into the PM. Will meters logged using ErgMonitor show up on my PM's odometer? No, your PM will not be hooked up at the same time as ErgMonitor so the PM will not register anything while ErgMonitor is in use. Why do I care about seeing my Force Profile or any other data that is not available on the PM2(+)? Serious training and performance requires accurate and detailed information about what is going on, ErgMonitor provides this accuracy and detail at a level rarely explored outside a laboratory. Do I have to watch my computer monitor while using ErgMonitor? No more than you have to watch the PM during a workout, however every stroke can be reviewed later. Will my times on ErgMonitor be comparable with the PM2? Yes, the same math is used*, tests have all shown to be within 0.1% of PM2 times (Closer than the PM1, and PM1 times are considered legitimate for logging purposes. However, If you are planning on a WR performance, please do it on the current C2 Performance Monitor, unless C2 says differently.) 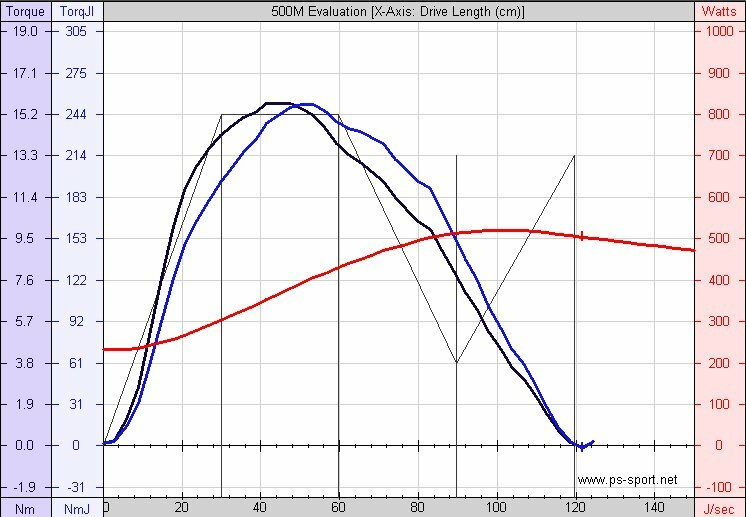 *The physics is the same, however the slight difference that has been found is most likely due to various decisions that have to be made regarding exactly what segment of data is used to calculate Drag Factor, and that information is a C2 secret. As you can see, there is a wealth of information presented, however all the standard items will be familiar to most Rowers/Ergers. Click button to order. Cookies? **Washington State residents will be charged 9.5% Sales tax.